Elite Force 0.20g Biodegradable BBs are the #1 choice for environmentally friendly players looking for the best airsoft BBs. Their impeccable manufacturing process, laser accurate performance and durability akin to the strongest plastic pellets make Elite Force second to none. If your gun shoots in the 280-350 FPS range, Elite Force should be your first choice when it comes to biodegradable BBs. Having captured the hearts of both airsoft beginners and veterans, their reputation is well earned. 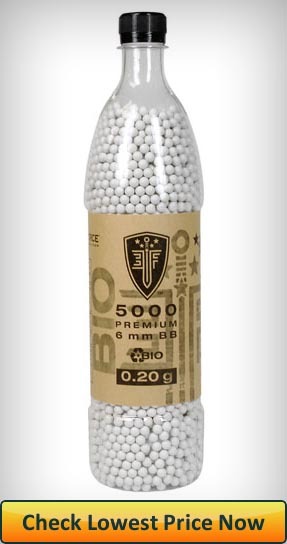 If you came to this website trying to find the best airsoft BBs – Elite Force 0.20g Biodegradable BBs are what you were looking for. Psst! Looking for the optimal airsoft assault rifle for a day on the fields? Check out my comprehensive guide on the best airsoft gun now! 2 Who are they for? 0.20g BBs are most suited for beginner to mid level guns shooting in the FPS range of 280-350. Being 67% heavier than the entry level 0.12g BBs, these pellets will be able to resist weather conditions much better. In conjunction with a more powerful weapon, this heavier weight directly translates into a better degree of accuracy and longer range capabilities. The rule of thumb is that accuracy is directly correlated with the weight of a pellet. If your gun manages to consistently shoot over 350 FPS – you might be better served if you were to use 0.25 or even 0.28g BBs. Their biodegradability makes Elite Force 0.20g BBs perfect for those of us who are environmentally concerned. As more and more outdoor field prohibit the use of non-bio airsoft ammo, Elite Force Bio BBs prove a perfect choice for airsoft players everywhere. Elite Force’s Bio BBs are 6mm thick and weigh in at 0.20g. Both these figures sport a miniscule tolerance of +- 0.01. The pellets are white in color, making it very easy to spot them and adjust your aim mid burst. They are completely seamless, highly polished and void of any deformities or imperfections. Elite Force’s 0.20g BBs are one of the most consistently flawlessly crafted airsoft BBs I’ve ever seen. Their grand reputation among airsoft veterans is well deserved. 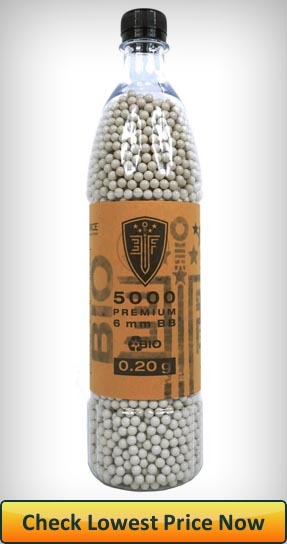 Elite Force 0.20g BBs are sold in 2700 and 5000 count bottles. The choice to go with a bottle container over a bag or a tub is a strategic one as it facilitates a much easier magazine loading process. All biodegradable BBs are usually made out of a homogeneous resin. This resin is often very brittle and prone to shattering on impact. Elite Force have somehow cracked the code and created an extremely durable yet biodegradable airsoft pellet. They are by far the most advanced Biodegradable ammunition manufacturer the airsoft world has seen. When it comes to the degree of biodegradability, their BBs should biodegrade within 12 months under perfect conditions. Under normal conditions, you may experience longer degradation times. I always try to be impartial, objective and 100% genuine. I try not to talk in absolutes and be definitive as different guns and unique circumstance will greatly affect a product’s features. Elite Force BBs are the most accurate biodegradable 0.20g pellets I’ve ever used in my life. Elite Force didn’t just set the bar high, they maxed it out. You can’t hope for anything better in terms of accuracy. In grouping tests, Elite Force BBs achieved a 4 inch diameter at 75 feet with 15 shots fired at the target. You won’t find any other biodegradable BB shooting this accurate at such ranges. When it comes to craftsmanship, Elite Force display the pinnacle in manufacturing prowess. Their pellets are seamless, creaseless, without neither bubbles, dimples nor imperfections. They have a perfect spherical form consistently throughout the batch of pellets. In addition, their BBs are smooth and highly polished to ensure a reliable and similar performance pellet to pellet. The perfect roundness ensures minimal air drag which contributes to the astounding accuracy of Elite Force BBs. In the durability department, to no one’s surprise, Elite Force once again take first place. Strength and structural integrity is a very important topic when it comes to biodegradable pellets. Due to their different makeup, they are very often too brittle for competitive combat. Shattered BBs are dangerous for opponents and weak pellets dangerous for your gun. Elite Force’s Bio BBs are often mistaken for plastic ones due to their similar strength. Being confused for non-bio BBs is the highest achievement any biodegradable pellet manufacturer could hope for. In comparison to bio competitors, that shatter into dozen of pieces when tested with a hammer, Elite Force BBs only break in one or two places. This means they are very unlikely to break apart inside your gun or represent a danger to players wearing wire mesh eye protection. All in all, a stellar, unsurpassable performance from Elite Force. Elite Force employs a very smart approach to packaging. Instead of the usual inconvenient tub container or flimsy bag, the manufacturer has decided to sell their BBs in bottles. The 5,000 count bottle is 12 inches in height and 3 inches in width. Initially a bottle seems like an odd and unattractive choice. This is immediately rectified by the immense convenience that a bottle offers. As you load your Hi Cap magazine, instead of having to hand load it by hand, you simply use the bottle opening to pour your ammunition into the magazine. The bottle cap is screw on and not a flip-up, which can easily break off. Bottles are also much easier to handle and transport than big tubs or gripless bags. By using a bottle, you save a lot of time and more importantly – you don’t dirty your pellets by touching them with greasy hands. A more convenient, faster and better way to load your magazines – a clear winner in my book. Due to their immense reputation and truly an incredibly performing product, Elite Force has priced their BBs accordingly. Cheap is definitely one thing these BBs are not. While you might find competitors offering biodegradable 0.20g pellets at half or 2/3 the cost, Elite Force rain supreme in the price-performance ratio. I do believe their premium pricing is justified, provided they will result in the single best airsoft BB experience of your life. You won’t find better BBs on the market. Not today, not tomorrow. In airsoft and life in general I have found that it’s always prudent to pay a premium for a the best quality product. Elite Force 0.20g BBs live up to their reputation and then some. Without a doubt the best airsoft BBs offered on the market today. Their unfair accuracy, impeccable workmanship and incomparable performance will suit and playstyle just perfectly. Do you have any questions about Elite Force 0.20g Bio BBs? Ask in the comments below and I’ll get back to you. If you’ve had experience with Elite Force, let the newbies know and leave your thoughts below.